The latest Twiplomacy study by BCW reveals that US president, Donald Trump has become the most followed world leader on Twitter, with 52 million followers on his @realDonaldTrump account which has more than doubled since taking office on 20 January 2017. Donald Trump became the most followed world leader in October 2017 when he passed Pope Francis (@Pontifex) who is the second most followed world leader with more than 47 million followers on his nine language accounts. Indian prime minister, @NarendraModi takes the third and fourth spots, with 42 million followers on his personal account and 26 million followers on his institutional account, @PMOIndia. The official Twitter account of the US president, @Potus ranks fifth and @WhiteHouse ranks sixth, with 23 and 17 million followers, respectively. As of 18 May 2018, the heads of state and government and foreign ministers of 187 countries had a presence on Twitter, representing 97% of all 193 UN member states. The governments of only six countries, namely Laos, Mauritania, Nicaragua, North Korea, Swaziland and Turkmenistan do not have an official presence on the platform. Even the Chinese government’s State Council Information Office maintains a presence on Twitter, Facebook and YouTube. Facebook is the second-most popular network among government leaders, and it is where they have the biggest audience. Instagram has become the third-most popular social network for governments, with 81% of all UN member states having set up an account and many of them are sharing daily Instagram stories. 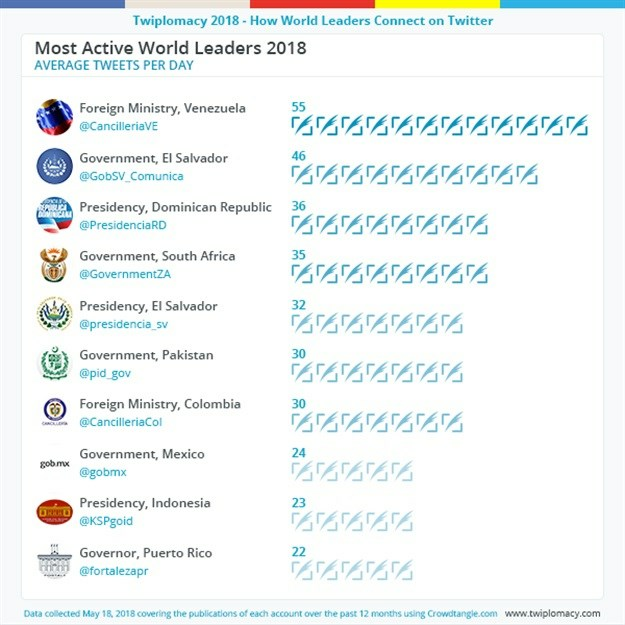 The BCW Twiplomacy study analyses the activity of 951 Twitter accounts of heads of state and government and foreign ministers from 19 May 2017 to 18 May 2018 using aggregate data from Crowdtangle.com. 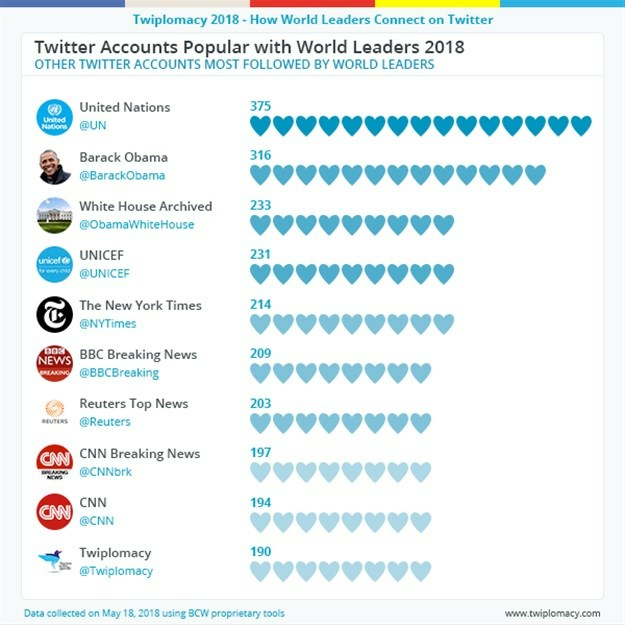 The US president is among a very small group of world leaders who are personally active on their own Twitter accounts and his tweets have generated 264 million interactions (likes and retweets) over the past 12 months, more than five times as many as Indian prime minister, Narendra Modi, with 52 million interactions, and 12 times as many as Pope Francis, with 22 million interactions. The tweets from @realDonaldTrump garner on average more than 20,000 retweets. In Latin America, Mexico’s outgoing President Enrique Peña Nieto @EPN has 7 million followers, far ahead of Colombia’s president, @JuanManSantos, and Argentina’s @MauricioMacri, with 5 and 4 million followers, respectively. 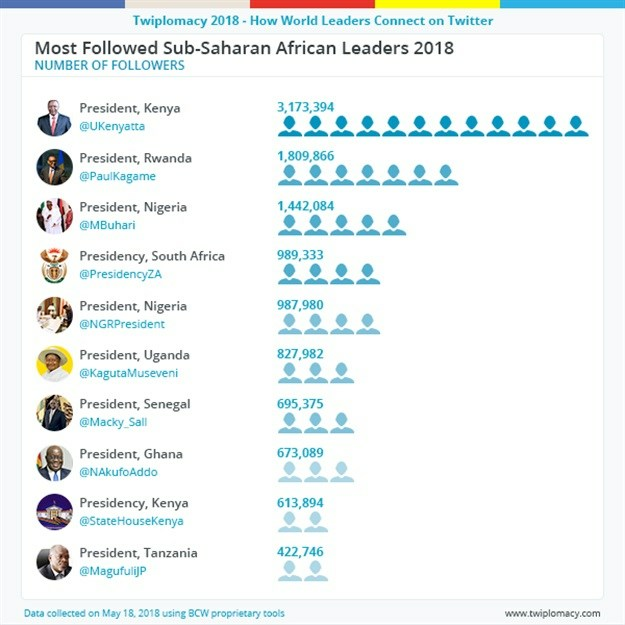 Kenya’s Uhuru Kenyatta @UKenyatta is Sub-Saharan Africa’s most followed leader with 3 million followers, ahead of Rwanda’s @PaulKagame and Nigerian president, Muhammadu Buhari (@MBuhari) with more than 1 million followers each. The institutional account of the UK prime minister, @10DowningStreet, is the most followed EU leader, with more than 5 million followers, ahead of the British @RoyalFamily and French president, Emmanuel Macron, with more than 3 million followers, respectively. @EmmanuelMacron has almost tripled his followers since his election in May 2017 and he has surpassed the @Elysee Palace and Spanish Prime Minister @MarianoRajoy who complete the top-five list of the most followed EU leaders. Among the foreign ministries, the U.S. State Department (@StateDept) is the most followed, with 5 million followers, ahead of the foreign ministry of Saudi Arabia (@KSAMOFA) which has shot into the second position with more than 2 million followers. The Dutch government is the most conversational on its @Rijksoverheid account, answering citizens’ questions about policies, laws and regulations. More than 97% of its tweets are @replies to other Twitter users. The @GOVUK channel is in the second position followed by the government of Nepal’s “Hello Government” (@Hello_Sarkar) account, with 95 and 90% of their tweets being @replies answering questions from users.